Or should you? Turns out I did hurt myself (I tore the muscle that attaches to the Achilles tendon in my right leg)... but that didn't detract much from the day which was so larger than life. Hopefully I will heal up and be 100% in time. Nothing an MRI, a specialist and loads of time can't fix. Sigh. 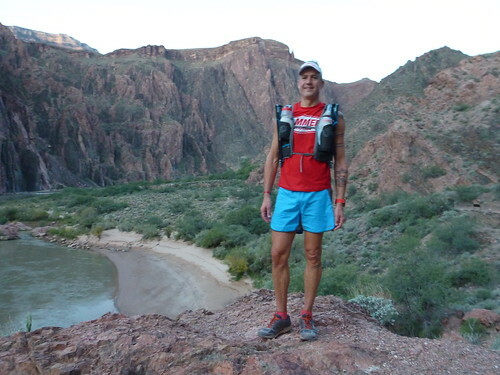 The Grand Canyon rim-to-rim-to-rim trail run is an iconic route. 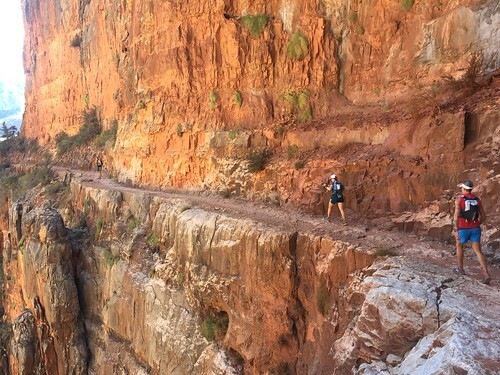 It's a classic FKT (Fastest Known Time) that's been held by notable runners like Dakota Jones, Rob Krar and was recently smashed into little, teeny, tiny pieces by Jim Walmsley. But we were not here to push the pace, even for us, we were here to soak it all in. Boy was there a lot to soak in. Because this route takes a long time to complete and because it can get hot down in the canyon even this time of the year we started early. Our group was Lucca Criminale, Thomas Frizelle, Brett Rawson and myself. And by early I mean 5:00 AM. The moon was huge! And bright! 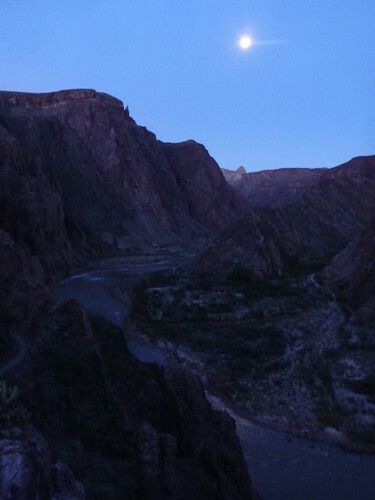 On this run we got to see the moon set, the sun rise, the sun set and the moon rise again. So BEAUTIFUL. 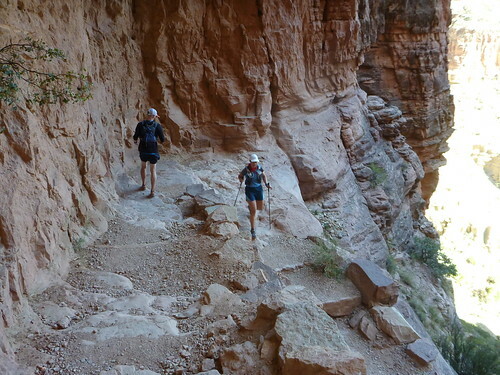 To maximize the epicness we decided to run down the South Kaibab Trail, up the North Kiabab Trail and then take the Bright Angel Trail on the way back to the south rim. I am so glad everyone else was on board with this as I am not a huge fan of strict out-and-back runs. Plus, I wanted to see both trails on the south side! 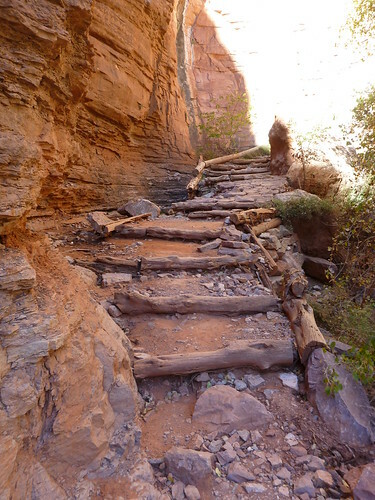 And as it turned out, since the Bright Angel Trail meanders through two little green patches and runs along a creek for a couple of miles I thought it really was the more scenic option. And I always like the sound of running water. The trip down to the river was a little surreal. The trail is incredibly rutted side-to-side from all the mule trains AND it's all dug out behind the waterbars which show up about every 10-20'. When you are not going down an actual staircase that is. So you're hopping/bouncing/running/walking down this rocky, rutted trail. And it's totally dark except for your headlamp. And whenever the trail was not in the moon shadow I was trying to look around and enjoy the view. 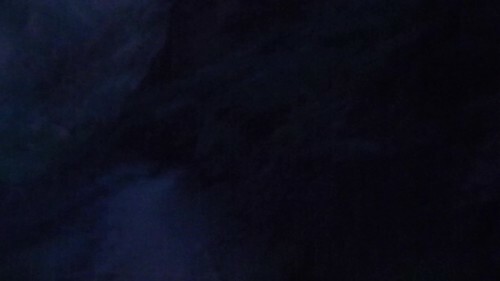 There were several spots where I stopped to stare off the trail into total darkness but you could absolutely tell that it was a sheer drop of many hundred feet. Exciting! On the way down we passed a handful of hikers heading up(!) and a big group of runners from San Francisco that was also out for their own R2R2R. I stopped at the halfway point to avail myself of the composting toilet and there was some guy camping on the walkway just outside of the doors! Guess that's what you do when you don't have a permit? Oh man was the smell potent... I can't imagine what that night must have been like. 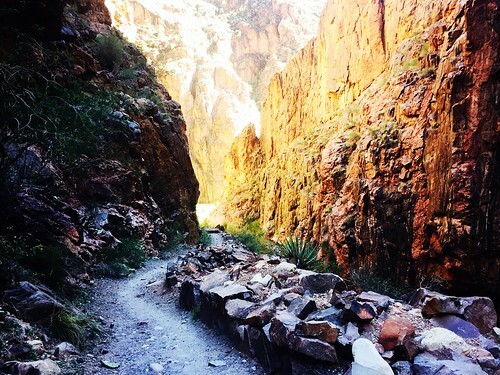 ASIDE - my sister's husband was a park ranger for 27 years in the canyon and after hearing me proclaim how busy this trail was on a weekday he laughed and said that during the early summer they see SEVEN HUNDRED AND FIFTY RUNNERS PER DAY. That's just runners people. Plan accordingly, you have been warned. At the bottom I got some footage. There is a short tunnel just before the bridge. I wish I had a better camera. 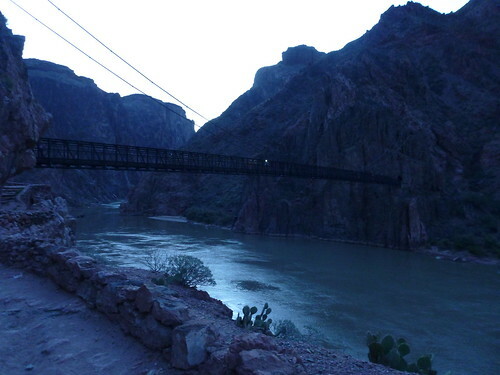 At this time of day the bridge and the Colorado River looked amazing. Did I mention that it was nice and warm? 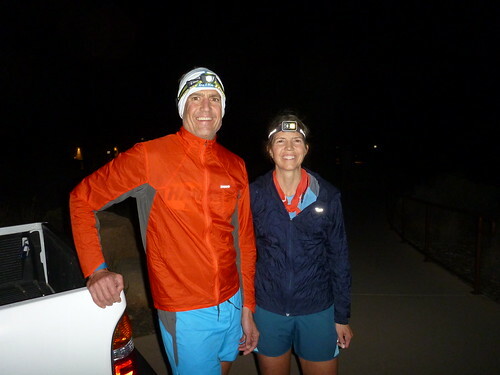 At the start I had on two shirts and a wind jacket, gloves and buff, all that was gone by the time I hit the river. We were all so worried we would freeze on the rims and on this day that just was not the case. Another planning tip - I hear the temperature can vary 30-40 degrees from rim to river. Pack accordingly. 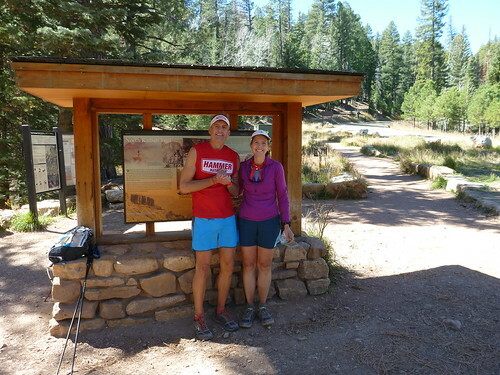 We crossed over the Colorado and then ran up to Phantom Ranch. At this hour the cantina was still closed but all we needed was water and then we were on our way. Turns out this run is VERY well supplied with water. I brought along a filter just in case we needed to use a natural source but there was never a need. The longest we went without potable water was maybe seven miles? My two 24 oz. bottles were ample. That said, I consumed about 12 bottles worth of liquid in total! 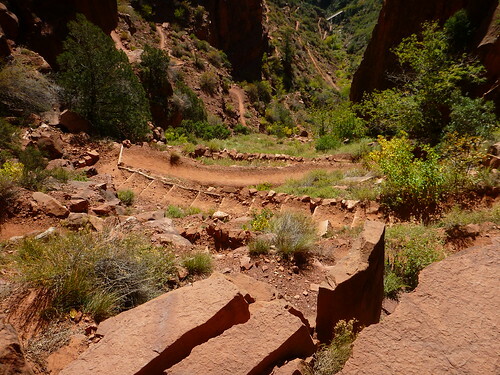 The North Kaibab Trail from Phantom Ranch to Cottonwood Campground and beyond is super runnable. And so scenic! I took gobs of pictures and movies on the way but this shot by Brett is stunning. At Roaring Springs you turn left out of one canyon and into another. From here the trail gets steep and I was no longer running. I just couldn't put my camera away! And then we arrived at the north rim. On the way up we saw a sign that indicated water had been turned off at the north rim but when we arrived it was running. Whew! We had all underestimated the amount of liquid required for this 10-mile stretch (5 up and 5 back down to Roaring Springs) so it was a very, very nice surprise. We had gotten somewhat separated on the climb but on the descent we more or less stuck together. Which was great because it gave us the opportunity to film each other. I think this is my favorite shot from the entire trip. Thanks for capturing it Tom. This is what much of the trail was like. As Brett said, "Don't look left!" 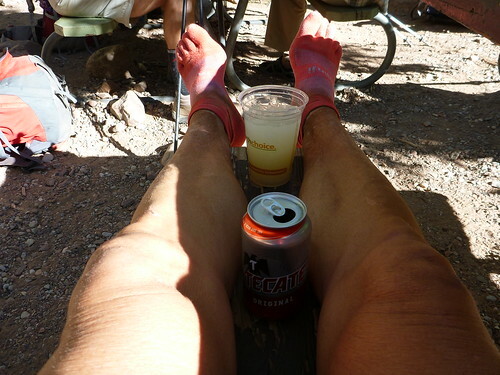 Once the trail flattened out again I was able to run most of the way back to Phantom Ranch but by now I was getting tired and my right Achilles was not enjoying the journey. At all. This time the cantina was open. I heard the lemonade here is to die for. I found it pretty average and overly sweet so I got something else to counteract the sugar. 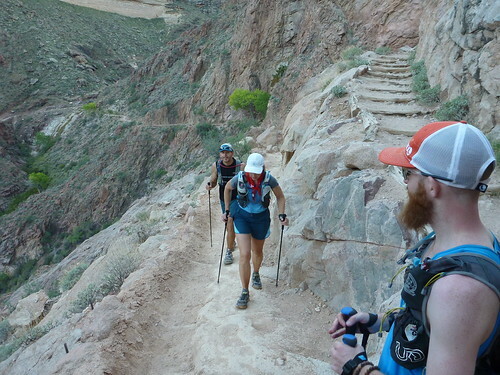 We regrouped and then ran across the other bridge back to the south side of the Colorado. 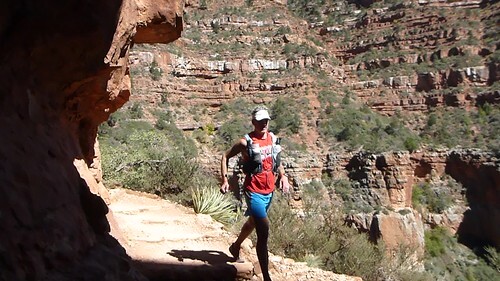 We paralleled the river for about one mile on the appropriately named River Trail and then headed up the Bright Angel Trail. 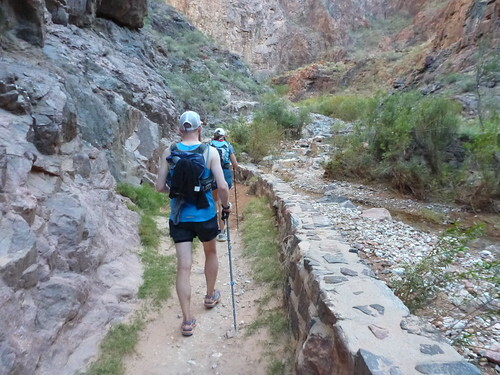 This trail is much greener than the South Kaibab Trail and I was feeling good about our choice right away. There is a section of trail here named the "corkscrew", here's why. 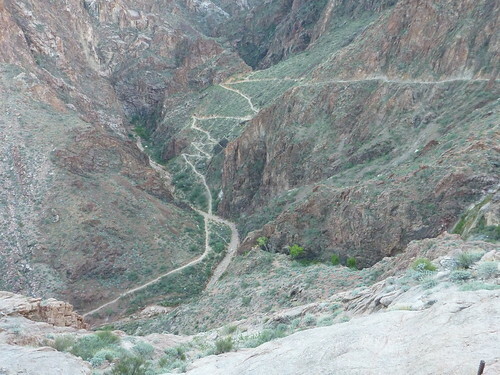 Switchbacks are not in short supply anywhere in the canyon. On the way up we encountered a few other hikers and a deer that was totally unconcerned about our presence, it just stood there five feet away as I took its picture. As we continued up the sun set again. I found myself playing a game of chicken with my sister. Lucca was in front and did not have her light out. I was in back and resolved not to get my light out until after she did. She won. In fact, I was the first person to get out their light. Loser. 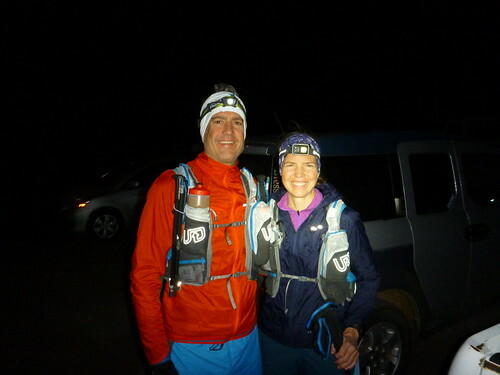 Once the natural light was gone and before the moon rose our headlamps were the only source of light and without any light pollution I'm always amazed how well a little light works, seeing the trail was never a problem. And it didn't get cold! I didn't need to change out of my sleeveless shirt until I got to the top. After the corkscrew you head up the valley some more and then it's switchbacks all the way to the top. They are endless. And since it was too dark to see the trail up ahead all you could do was keep your head down and continue trudging uphill. There were a few times when I could see headlamps ahead of me which helped to gauge the distance but not much as I had no idea how far these other people were from the rim. Basically it just told me I was not there yet. :) With no wind sound also carried very well here and I could definitely hear other conversations that were happening on this trail even though I could not make out the words. 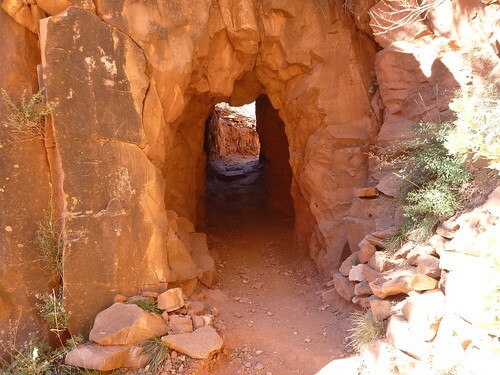 Finally I went through a rock tunnel, then I passed a building and then the trail turned to asphalt so I knew I was close. And suddenly, without an fanfare I was on the rim. Here is the "after" shot of Lucca and I, we have put some clothes back on to guard against the breeze. After a quick shower we were invited over to a friend of Lucca's for dinner! What amazing hospitality. 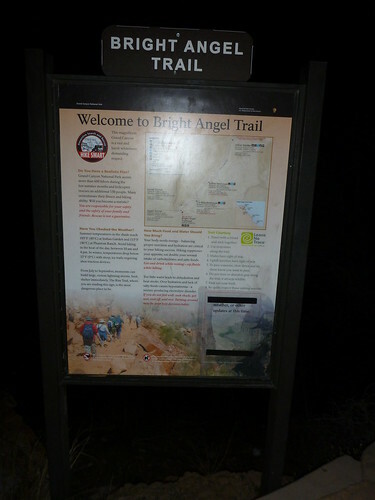 Luckily we were staying in the lodge right at the rim so our room was just one mile from the trailhead. In. Out. Food. Beer. Awesome. If you pay attention, you can see the geologic layers change (each one has a distinct color) as you descend into and climb out of the canyon. And if you take a few minutes and read some literature or a sign before you start your run you will know the approximate age of the layer you are running through. It was pretty cool to run through over a billion years of rock! Other than my Achilles I got a blister on my left foot but I felt that early on so bandaged it up right away and it didn't get any worse. Weather - it was about 40 degrees at the start but it quickly warmed up to the mid 50s and then once we were in the sun it was about 80 degrees. Perfect in other words. 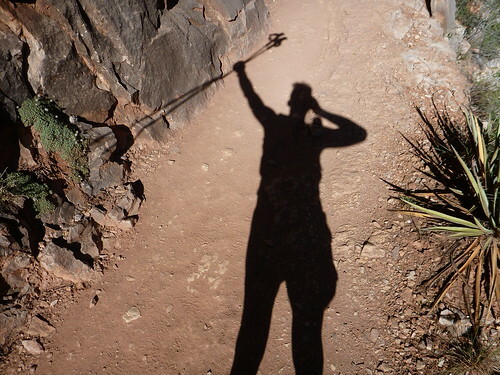 There was some wind going up and down the North Kaibab Trail but it was not too dry or too strong. Great report! Congrats on knocking off a classic. @Angleman - thanks! We could not have picked a better day.